Jess is an acupuncturist and herbalist licensed in the state of North Carolina. Jess earned her Master’s at Daoist Traditions College of Chinese Medical Arts in Asheville. She is nationally board certified (NCCAOM) in Oriental Medicine. 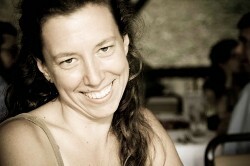 Jess has been practicing at Asheville Community Acupuncture since 2009. Jess has been a co-owner of Asheville Community Acupuncture since May 2018. She enjoys working with all types of people and conditions but has a particular affinity for women’s health (including fertility, pregnancy & postpartum), hormone imbalances, as well as working with generalized anxiety and stress. Jess has been studying Functional Medicine since 2015, particularly as it applies to thyroid, adrenal and autoimmune disorders. Her needling technique (most similar to Japanese style) is very gentle and is excellent for children and clients new to acupuncture. Jess grew up in Baltimore. She received her B.A. from Bowdoin College in Maine. Prior to relocating to Asheville in 2005, she spent five years living on an ecovillage and organic farming commune in Missouri. She moved to Asheville to study Chinese medicine in order to better serve her family and community. When she is not at the clinic, Jess is parenting her young daughter and teenage son. Jess is passionate about herbal medicine (both eastern and western), self-cultivation, mindfulness and metaphysics. She is excited to see quantum science proving the validity of esoteric traditions and "new age" healing arts.